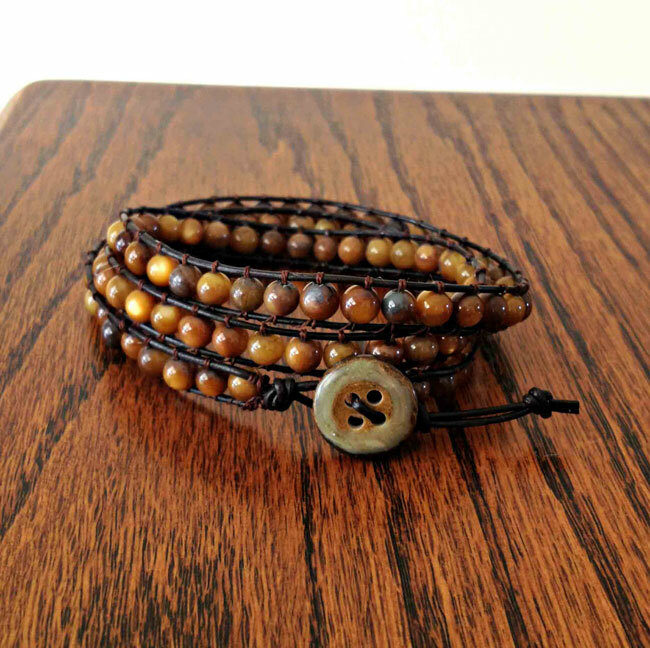 Get step-by-step instructions with pictures for making a beaded diy wrap bracelet for a fraction of the cost of designer bracelets like Chan Luu. I have to admit, I love accessories, especially bracelets and necklaces! 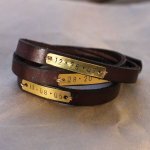 For the holidays this year, I made several of these Chan Luu inspired DIY wrap bracelets as gifts. I just finished my last one for a while for a late holiday gift exchange. Each one got a little better than the last as I learned a few tricks along the way. Hopefully these tips help you make your first one perfectly from the start. I still need to make one for myself. I’m kind of loving the turquoise one I made for my mom. I have a few other new projects to do first though. So many projects, so little time! 140-150 2mm beads or 125-130 3mm beads. If you’re buying beads at Michaels or Joann’s, this will be about 3 strands with some leftover. *some links may be going to affiliate links with trusted retailers. Step 1: Cut your leather cord in half. Hold the two cords together and tie a knot about 4 inches from the end. Step 2: Cut some beading thread about 25″ long. Thread it through your needle. Tie your beading thread in a double knot around the cord on the right side leather cord near the knot you made in the leather cords. Step 3: Put your needle and thread under the left side leather cord, then go up and over it and underneath the right side leather cord and up and over. Repeat in this figure eight fashion about 6 times and pull up tight against the top knot. Then tie another double knot around the right side leather cord. Do not cut the thread. Step 4: Starting Your Beads – I like to hold mine with my left hand (I’m right handed) parallel to the table. I started with the thread knot on the bottom cord. Take one bead and put it between the two leather cords. Thread your needle through the bottom side of the bead, when you come up through the top, go over and around the top cord. Then put your needle into the top of the bead and go back through. This time when you come out the bottom of the bead with your needle and thread, go underneath the bottom cord and around. Go back through the bottom of the bead, over the top cord, around and through the top of the bead, back through, and needle coming out underneath the bottom cord. I essentially passed through each bead 4 times (2 from the bottom, and two from the top, alternating). Most of the tutorials I’ve seen so far, only have you go through 2 times per bead (1 from the bottom and one from the top. I did this with the first bracelet I made, and I wasn’t as happy with the finished product. It wasn’t as sturdy or as straight as I wanted. When you start the next bead, your thread will be behind the bottom thread. You will put your bead in the middle of the two cords and bring your needle on top of the bottom cord through the bead and needle over the top cord. You’ll always be going over and behind the top cord and behind and over the bottom cord. I used a wrap bracelet I had as a guide for length, but I held it against my wrist regularly to check for fit. 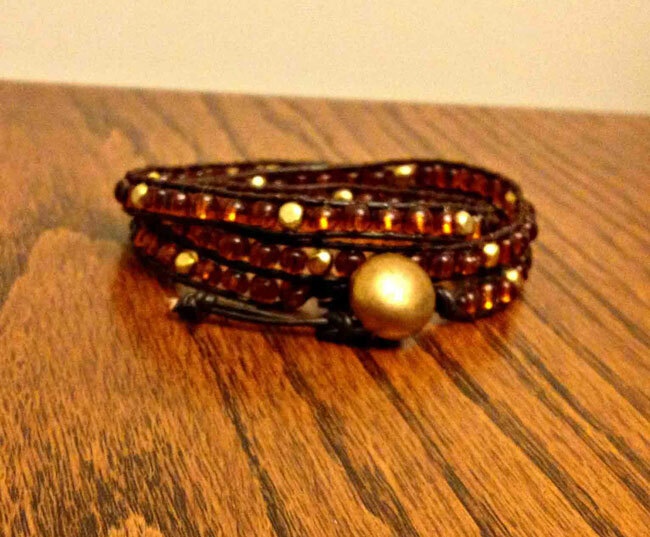 I found that 12″ of beading for a double wrap and 18″ of beading for a triple wrap worked well. It won’t be workable for you to work with long enough thread to do the whole bracelet. I liked working with 24″ lengths at a time. When you get about 4″ from the end of your thread, tie another thread onto it and snip the ends fairly close to the knot. I like using a dot of beading glue to add strength to the knot. Let it dry for a few minutes and then carefully continue beading until you get past the knot. You can use the beading glue later to glue the threads down if the knot doesn’t get hidden in your beads. Step 5: When you get to the end of your beads, take the two leather cords together and tie a knot as close to the beads as possible similar to the knot you made when you started. 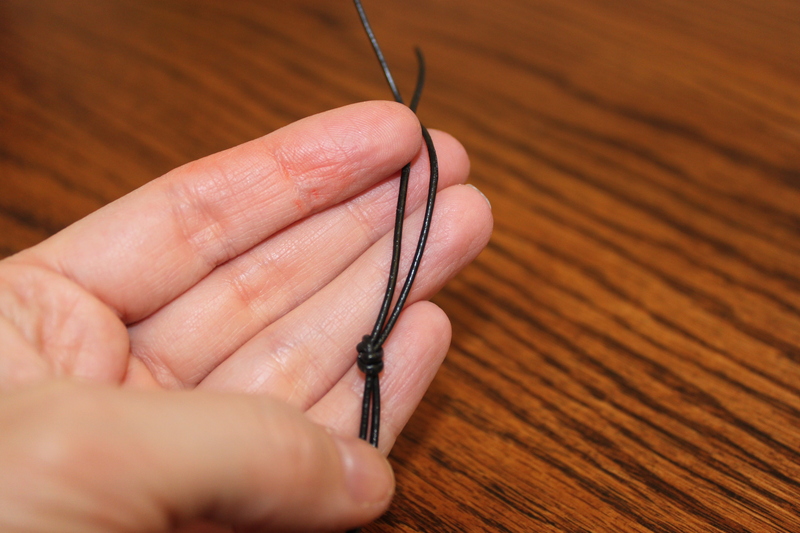 Tie a double knot with your thread around one of the leather cords close to your last bead. Weaver a figure eight pattern at least six times, just like you did when you started your bracelet and finish off with a double knot around the cord near the knot in the leather. Snip the end of your thread. Step 6: Now it’s time to add the button for your closure. Go back to the end you started your bracelet with. Thread your button through one of your leather cords. Take the other leather cord and tie them together in a double knot. Snip the ends close to the button. I’m showing a button here that has a shank on the back (no holes on the top of the button), but a regular 2 or 4 hole button also works fine. For those, you just thread one leather cord underneath the button through one hole and then over the top of the button and back through the other hole (if using a 4-hole button, do wholes on opposite corners). 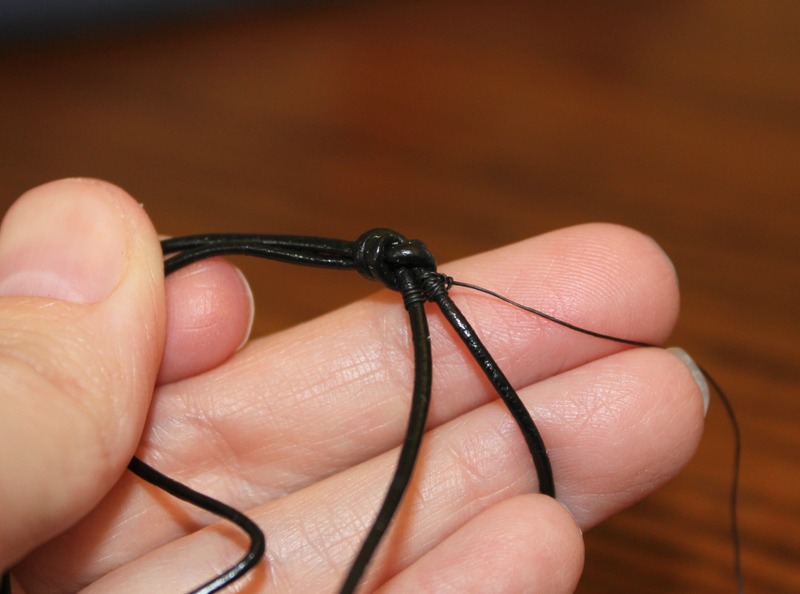 Then just tie it with the other leather cord like the example shown. Step 7: On the other end of your bracelet, you’ll move down your leather from the knot about the same size as your button. Then with your cords together, you’ll tie a knot in your leather cords. Don’t pull it too tight yet. You’ll want to test to make sure your button fits through the two cords between the knots. 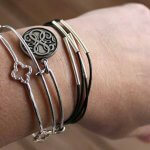 You want it to be a tight fit so that your bracelet won’t slip off. If you’re making this for someone else, you may want to do this a second time so that the bracelet is adjustable depending on wrist size. Cut the ends of your leather cords near but not too close to your last knot. 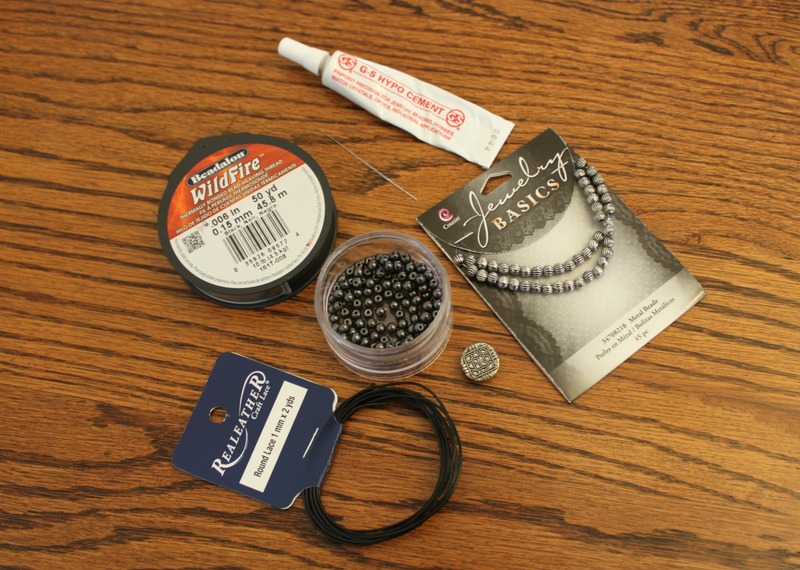 Step 8 (Optional): I chose to use beading glue to finish off my bracelet. I mostly used this to glue the threads at the start and end of the bracelet as well as where I knotted my thread in the middle of the bracelet. Let me know if any of the directions are unclear and I’m happy to answer in the comments or edit my instructions. I looked up directions on a few other sites to get through some tricky spots as I was making the first bracelet, so you can also try these sites to see if their directions are helpful you. Make It & Fake It and Buatkalunggelang. I made modifications, but you probably will too as you find what works for you. 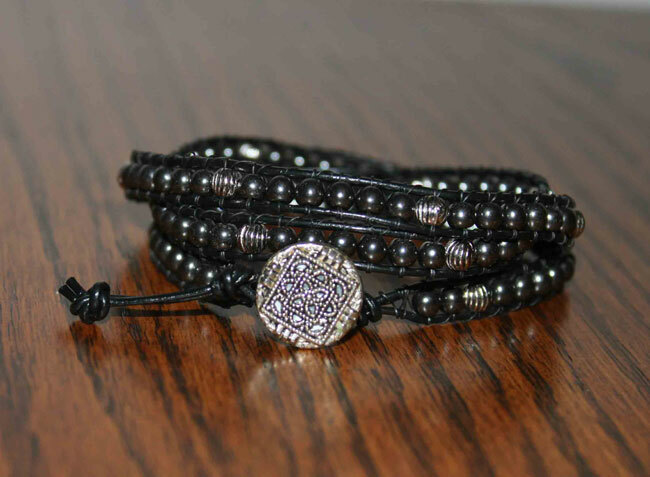 Here’s a look at the Chan Luu black and silver agate bracelet (left) and my DIY wrap bracelet (right). I chose 3 wraps instead of 5 and more black beads than silver. Hers are beautiful, but I definitely liked my $15 price vs. hers at $200. 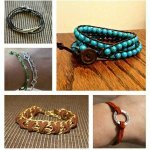 Here are a few of the other bracelets I made as gifts. Im so in loove!!! Thank you for such a great DIY ideas!! I LOVE your tutorial. It is the best I’ve seen. I have trouble moving through the steps because my computer is taking too long to load your large photos. I wish I could scroll smoothly back and forth. Thanks for letting me know. I attempted to resize the images, let me know if it helps. Great tutorial! I love your version and you make it look pretty easy! Thanks so much for sharing! Pinning! 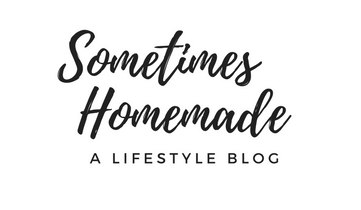 I’d love for you to link this up to our All Things Thursday Blog Hop if you get a chance! Hope to see you there! 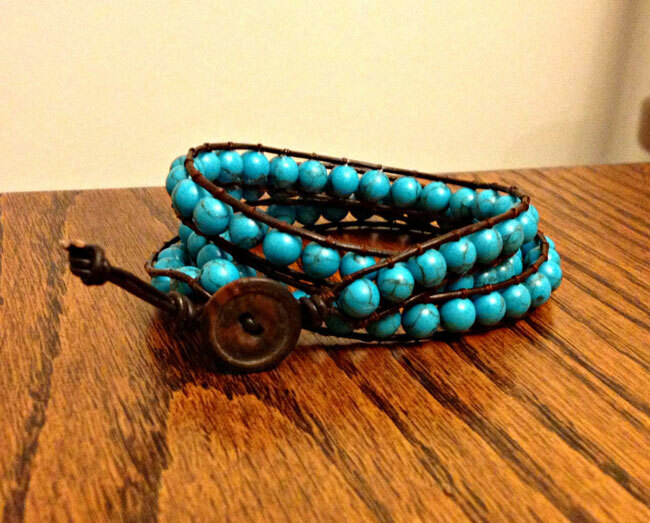 I have been looking everywhere for a tutorial on these bracelets that I can understand. Thank you so much!! You’re welcome! Hope it helps make things easier for you. Hi Bev – I go through each bead 2 times with the needle and thread. The first time I didn’t and it curled up. Going through twice seemed to solve my problem. Good luck! do you sell these? I would love to buy one via etsy!